In 1975 there was a great shortage of fish during the early months in the inshore waters that the Rye Fishing Fleet harvested. The situation for fisherman became quite desperate as the over 20 boat strong fleet netted fewer and fewer fish. Local man, Skipper Robert Hollands who fished out of Rye in the Agnes with Charlie Gill crewing for him, decided that they must start looking outside the traditional fish catch that was landed at Rye in the early months of the year and find a new species to harvest. Robert had often trawled up a few Scallops in his nets at certain places in the Bay and thought there might just be enough on these beds to earn a profit. He developed a Scallop Rake with fixed hinge and carried it on a hand cart to the Fishmarket where he was greeted by many knowing smiles and a few doubting comments. When the Agnes returned the smiles turned to looks of amazement – The ‘Aggie’ had landed 60 dozen of the sought after shell fish. The prices were good and within a year and with the introduction of a sprung loaded hing on a government developed rake five more boats from the Rye Fleet were out Scalloping like mad. The good times had returned. Robert fished Scallops exclusively from Christmas to May every year. Since then the quality of the Scallops raked out of Rye Bay have become renowned throughout the world The late Charlie Hollands, Robert’s uncle, crewed for Robert in the early days on Robert’s first boat ‘The Violet. Charlie’s father Joe was killed by German machine gun bullets while fishing off Rye in the Second World War. Charlie had more grief to bear when, in 1958 when fishing with his brother Edwin, their boat was run down and cut in by a freighter. Charlie survived but Edwin drowned before help arrived. Robert built his own Fishing Boat in 1978. The High Society was made of concrete and fished successfully for many years. Robert’s sons Robbie and Glen became crew members when they were old enough. Q: What has 100 eyes, a hinge, a muscle and can swim? 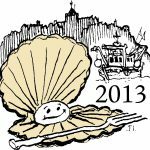 These are just some of the fascinating facts you will need at your fingertips when you sign up for one of the fun quiz nights during the Rye Bay Scallop Week. 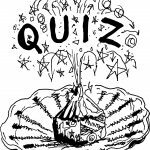 Kick off the week at the Scallop Quiz Night at The New Inn, Winchelsea, on Tuesday 5th February at 8.30pm. You could follow up the next night by attending the Scallop Quizine at The Ship Winchelsea Beach on Wednesday 6th at 8pm. There will be a special supper and a generally “fishy” theme to the evening so swat up on your facts! By now you will have all scallop information off pat so the Bonfire Boys Scallop Quiz at The Brewery Yard Club on Thursday 7th of February will be no trouble at all and you can tuck in to nibbles and support the raffle. This starts at 7.30pm. Last, but by no means least, will be the Scallop Quiz Night at The Standard Inn on Sunday 10th February at 7.30pm. This will be a fun general knowledge quiz costing just £1 per person entry. The quiz will include a Rye Bay Scallop round and the winner takes all! Joining a Tour of the Ancient Port would be the perfect way to swat up on all the local facts you might need for the quiz nights. Registered tourist guide Jane Fraser Hay (member of the Institute of Tourist Guiding) is to conduct a tour of the Ancient Port of Rye. Join Jane for an interesting insight into a thousand years of Rye’s maritime history. Admission to the guided tour is just £3 per person but make sure you book in advance as Jane’s tours are very popular. The tour will take place on Sunday 3rd February at 10am. On Tuesday 5th Feb, from 2pm till 4pm there will be a fascinating Afternoon Talk at The Stormont Rooms titled ‘Absinthe – The Green Fairy’, when Andrew Ashton will be giving a talk about Absinthe, the ‘Green Fairy’, and the artists who believed its hallucinogenic effects helped provide inspiration. Andrew will also be exploring any links that exist between absinthe and scallops. Just one of the many exciting events taking place through the Rye Bay Scallop Week is Russell Drew’s Talk and Taste at Market Fisheries. This is the perfect opportunity to learn how to ‘shuck’ or ‘cut’ a scallop or removing it from the shell. Russell appeared on the Hairy Bikers Sussex cookery programme demonstrating the cutting art and is very knowledgeable on all things fishy. Russell says, ‘This will be an educational session so that people can learn and ask questions about fishing in the bay, harvesting the scallops, the sustainability of local fish and I’ll also be teaching some filleting techniques’. Russell’s Talk and Taste sessions will take place on Saturday 2nd and 9th February from 10am till 12 noon. Also on Saturday 9th February there will be special Cooking Demos from 12 noon at The Mermaid Inn and from 12 noon to 2pm at Market Fisheries care of The Beach Bistro. ‘Scallops don’t get much fresher than this, literally hours from being plucked from the sea in front of us, eating them this fresh is a revelation, and I can’t wait to demonstrate a few really easy dishes for people to try at home.’ Says Trevor Hambley, Chef at The Beach Bistro at the Gallivant Hotel. Trevor will be delivering a scallop-themed cookery school right in the heart of the fishing port. Trevor has been working in partnership with Russell since he came to the Gallivant two years ago. His ‘boat-to-plate’ cookery school takes groups of people to Market Fisheries to see how they land the fish and to meet Russell and his team. Both Sunday the 3rd and 10th will see another unusual themed demonstration. Scallops and Sabrage at The Rye Lodge. That’s the art of decapitating a bottle of champagne followed enjoying a glass of bubbly and a dish of scallops served with a champagne cream sauce. •Did you know that Rye’s fishing fleet moors almost two miles from the sea? •There are more than 300 species of scallop in the world! 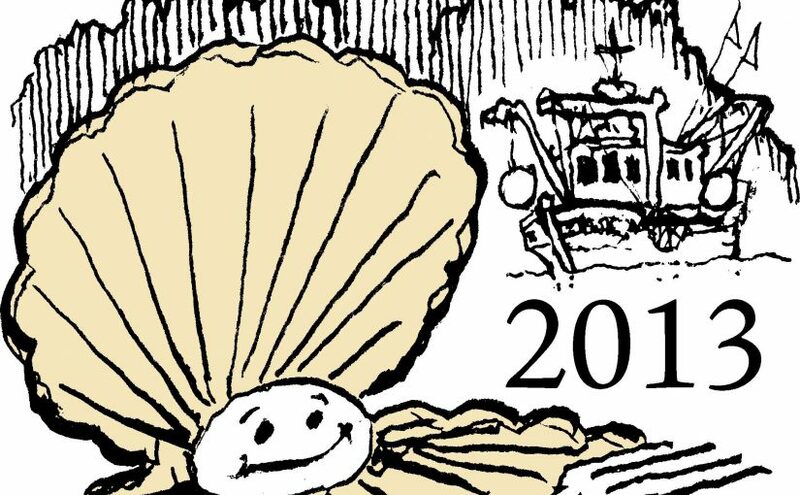 See the scallop.org.uk website for full details of the above and the many other special events that will be running through the scallop week. Wednesday 6th February 2013, 8pm sharp! The Rye Bay Scallop is a versatile shellfish and is incredibly easy and quick to cook. Local restaurants are busy preparing a terrific range of scallop dishes in readiness for the Rye Bay Scallop Week and some of the chefs have been kind enough to share some of their most popular recipes. Trevor Hambley of The Beach Bistro at The Gallivant Hotel, Camber Sands describes his Citrus Crusted Rye Bay Scallops with Trout Tartar and Oyster Jelly. He says, “This quite a complicated dish but can be broken down into manageable sections to do in the morning and day before, re-read the recipe several times and keep calm and carry on”. If you prefer a simpler dish then take a look at the recipes provided by Rye’s professional fishermen Ronnie Simmons and Brian Stent, who love to eat scallops. Scallops with Linguine featuring local scallops, lemon and pasta is described in mouth-watering detail by the Tuscan Kitchen and Gabby, the head chef at The George in Rye has posted a very helpful video clip showing how to make Pan Fried Scallops, Jerusalem Artichokes and Sherry Reduction. The Curlew at Bodiam has kindly sent in its tasty recipe for Rye Bay Scallop, Crispy Pork Belly, Apple and Ginger. Look out for “Scallop Top”, a cream stout brewed specially for Rye Bay Scallop Week by the Old Dairy Brewery. Pan-fried scallops shout out for a beer with a bit of attitude, particularly one that’s darker in colour. As part of this year’s Scallop Week, the Old Dairy Brewery has created a dry stout, similar to its Silver Top, just less sweet. A good body, hints of liquorice and molasses are balanced with a plain chocolate bitterness and notes of roast coffee, which give Scallop Top a wealth of flavours to create a remarkable match to this esteemed shell fish. Raise a toast to the Rye bay scallop with a glass of Sussex sparkling wine or a pint of Scallop Top cream stout.